Jamie Hamill has been handed a four-game ban by the Scottish FA after being found guilty of "excessive misconduct". The defender received a second booking and was dismissed for "knocking over" Ross County manager Derek Adams during Hearts' 2-0 win last month. Hamill has already served one match of the ban as a result of the red card, while another game is suspended until the end of next season. He will therefore miss Saturday's meeting with St Mirren. And, regardless of which club he is playing for, Hamill will be suspended for the first competitive match of next term. 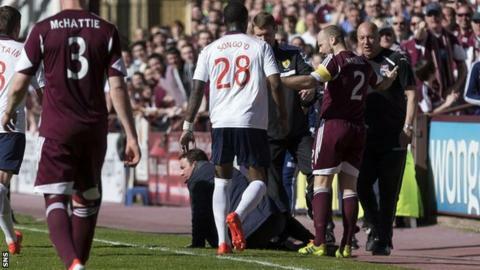 Hearts, who have been relegated to the Championship for season 2014-15, are in the process of exiting administration and Hamill is out of contract at the end of the current campaign. The incident involving Adams took place as Hamill celebrated scoring a penalty. An SFA spokesperson said: "Jamie Hamill was found in breach of Rule 201 - Excessive Misconduct. "Mr Hamill has received a four-match suspension, one of which has already been served and one suspended until the end of season 2014-15 if he breaches Rule 201 again. "The remaining two-match suspension will be served immediately."